Barbara sets the lunch table every Sunday, removing one chair to create a landing pad for my father’s wheelchair, nestling the season’s cut flowers in the midst of complicated glassware, and then arrives with two tall glasses of fresh iced tea for my nephew, Andrew, as soon as he appears at the door following church. 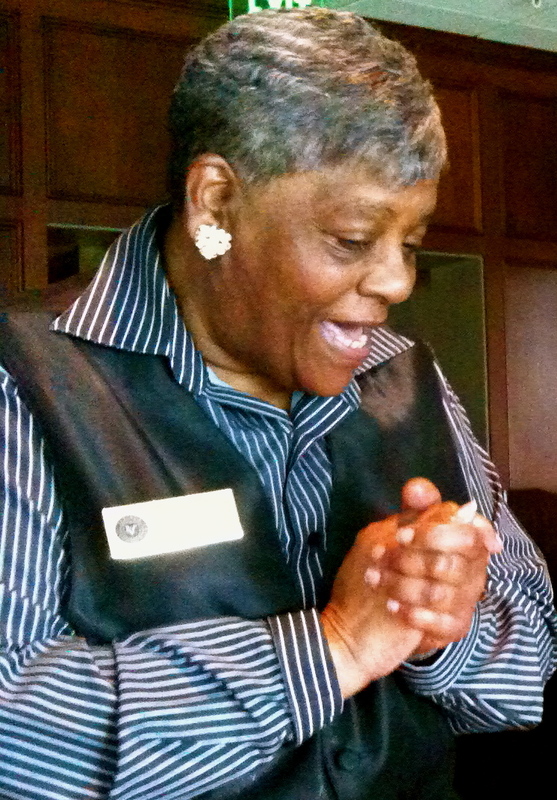 The Vestavia Country Club is easily navigable, and stays on my parent’s weekly schedule partly because of people like Barbara and the head valet and all who care about my father in small, important ways. On Christmas Eve, Barbara welcomes seven of us to lunch. She arrives grinning with the two iced teas, warms our plates for the buffet, slips my mother a wrapped gift – a pearled hook to hold her purse at the dining table. I’m tired of seeing your pocketbook on the floor! she fusses. Just before we leave, beginning our round of Christmas salutations, Barbara quietly announces her departure from the club. She has her own health issues, it seems, that prevent her from returning to her post in the new year. My mother is crestfallen – quickly exchanging phone numbers for staying in touch, and insists a picture be made together. Around us, the room swirls with the pander of a bulbous Santa Claus, bright holiday sweaters, children balancing plates of cookies, and the clinking of all that glassware. Barbara leans down to my father’s cheek and holds hers against it. She reaches her arms, as much as anyone can, around his shoulders, offering a last good-bye. Their silence holds everything. As my father wheels into the van, the valet slips packages of meats and sweets under the seat – Barbara’s parting benediction. An underground river of compassion, flowing from deep unto deep. I scoot into the back of their bumpy van, thinking of those who really count, in the end. The ones who show up, over and over, and carry the story with you. I think about how little everything else matters, except that which moved through Barbara’s hands. The dailiness of love. ~ by Susan on 01/22/2012. Your words are beautiful…moving…and cause me to want to meet everyone you write about. Your dad must be VERY proud! Ah Susan, your words land in my body making my heart melt. Those words really touch my heart. Thank you for sharing your story here. It is tender, inspiring. The one’s who show up…the dailiness of love. Amen to that. thank you for carrying this story forward. Thank you for sharing once again, Susan. I’m touched by this story, indeed. A perfect example of how something(s) that we do which may seem small to us may well make a lasting impression upon others. What comes from the heart is felt in the heart of another…a true connection. Thank you Susan.